The iconic huia was the largest of the five New Zealand wattlebird species. It was a striking large songbird, mainly black with long white-tipped tail feathers. Female and male huia had dramatically different bill sizes and shapes; this was the most extreme sexual bill dimorphism of any bird species. A fleshy orange wattle hung at the base of each side of the bill, and was often held pressed under the chin. Maori named the bird after its loud distress call, described as "a smooth, unslurred whistle rendered as uia, uia, uia or where are you?" The last accepted sighting was in 1907, but it is likely that a few huia persisted into the 1920s. New Zealand wattlebirds are crow- or starling-like songbirds. Genetic comparisons suggests that they shared a common ancestor with the satinbirds, berrypeckers and longbills of New Guinea. 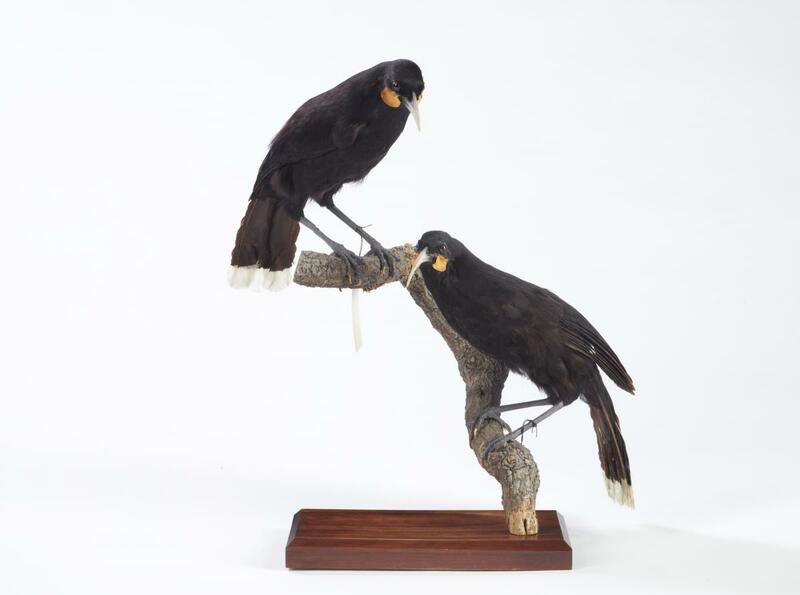 Together they form the New Zealand endemic bird family Callaeidae, comprising North and South Island species of kokako and saddleback (tieke), and the now extinct huia. All have (or had) rounded wings, limited powers of sustained flight, and use bounds, hops and jumps to move around forests. 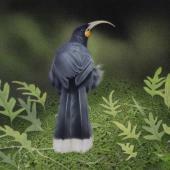 The huia was a magpie-sized glossy black bird. In fresh plumage, the black feathers had a green and bluish-purple metallic sheen. 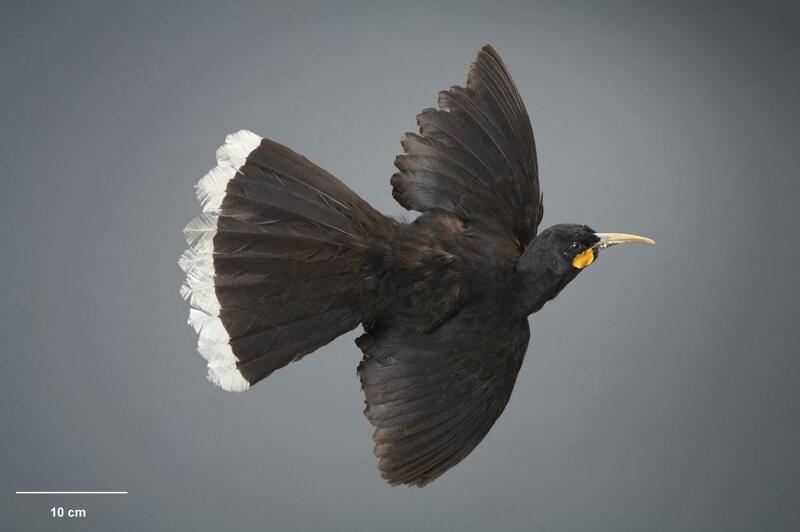 The long black tail feathers had 2-3 cm white-tips, forming a bold white band across the tail-tip. The bill was pale ivory grading to bluish-grey at the base, and yellow at the gape. 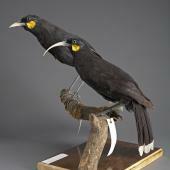 The female's long, slender, decurved bill was 85-104 mm long; the male's heavier, less-curved bill was 54-60 mm long. A bright orange or yellowish oval fleshy wattle up to 24 mm by 16 mm was attached at the base of each side of the bill, and was often held curled under the bill. The long legs were bluish-grey. Juveniles were brownish-black with an off-white tail band, becoming whiter with age, and white fleshy wattles becoming orange with age. Voice: various melodious and flute-like calls, audible up to 400 m away. 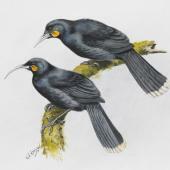 Similar species: both saddleback species resemble dwarf versions of the male huia, but with red wattles and rufous brown "saddle" markings on the back. 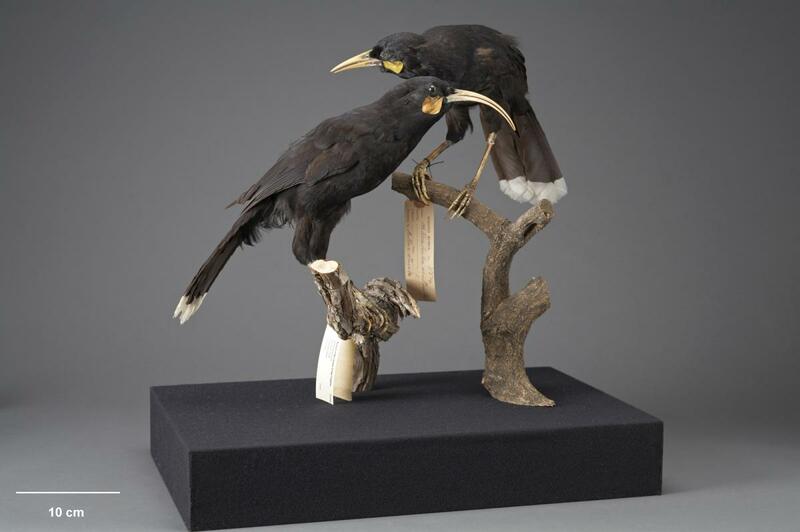 Pre-human huia bone remains indicate it was common throughout the North Island, but absent from the South Island. 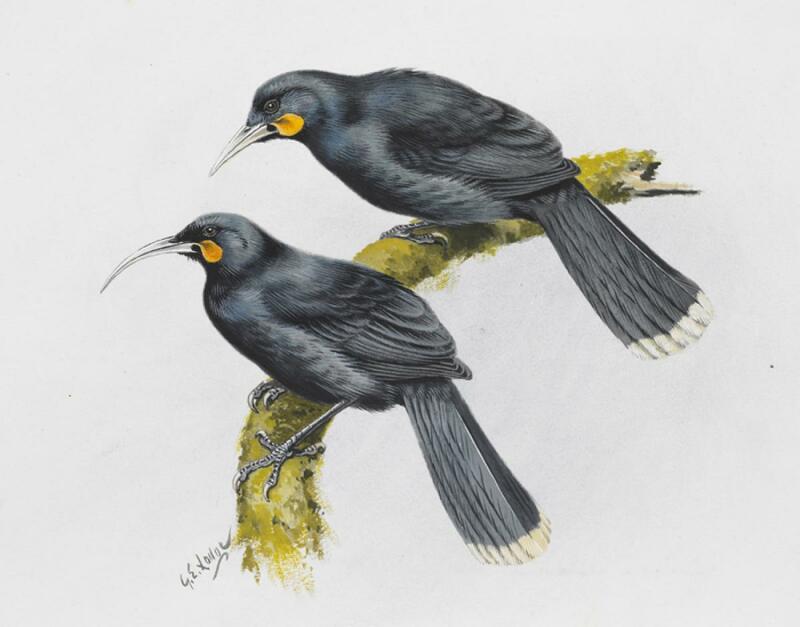 Huia were widespread but sparse after European settlement, in the eastern North Island from Huiarau south, with most records from the Ruahine, Tararua and Rimutaka ranges and northern Wairarapa, also the hills around Wellington. Genetic study indicates huia had "moderate to high" historical population of 34,000 to 89,000 birds; probably higher pre-human settlement. 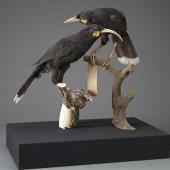 Predation by introduced mammals and, to a lesser extent, human hunting, was the likely cause of huia extinction. 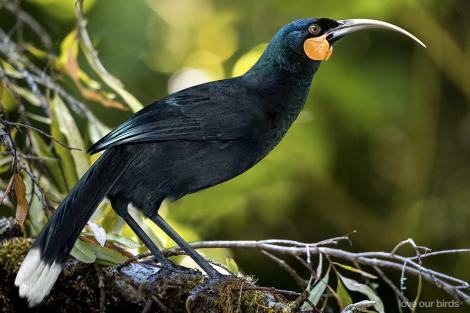 Large areas of native forest containing huia were logged or burned in the 1800s to make way for farming, but this would have caused a modest range reduction rather than being a major contributor to their extinction. 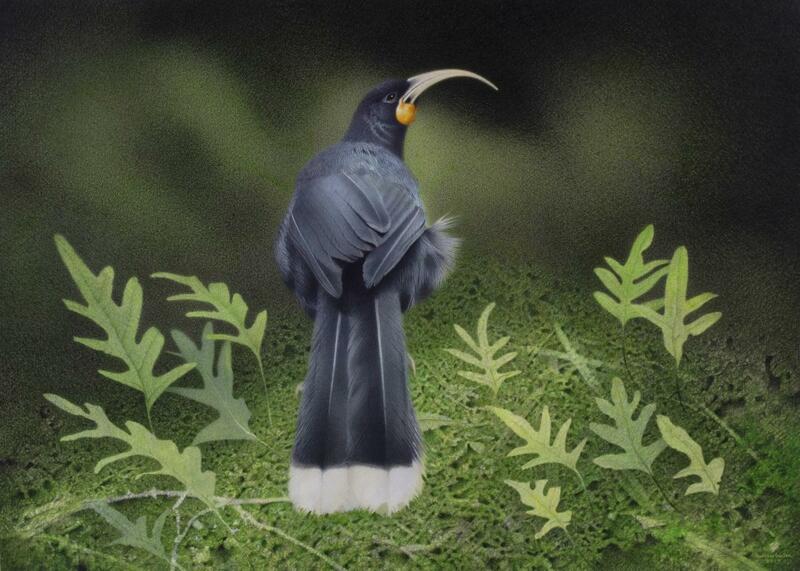 Maori traditionally prized and wore huia tail feathers as a mark of status. Tail feathers became fashionable in Britain after the Duke of York was photographed wearing one during a 1901 visit to New Zealand. 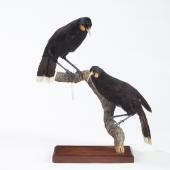 Overseas bird collectors and museums bought mounted specimens and tail feathers. Austrian naturalist Andreas Reischek took 212 pairs between 1877 and 1889. New Zealand naturalist Walter Buller recorded that 11 Maori hunters took 646 huia skins from forest between Manawatu Gorge and Akitio during one month in 1863. Gilbert Mair recorded eating "a splendid stew of Huia, Kaka, Pigeons & Bacon" with Buller at a bush camp in Wairarapa, October 1883, after shooting 16 huia and capturing live birds. Thousands of huia were exported overseas. Protection measures enacted in the 1890s were poorly enforced. 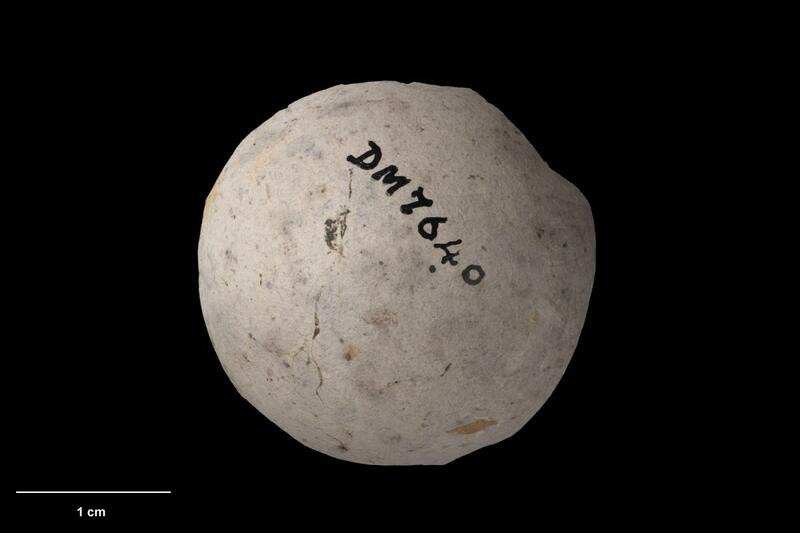 Two male birds kept at London Zoo in the 1880s died in captivity. Plans to transfer huia to Kapiti and Little Barrier island reserves never eventuated. A pair captured in 1893 for transfer to Little Barrier was acquired by Walter Buller and apparently sent to Baron Walter Rothschild in England. 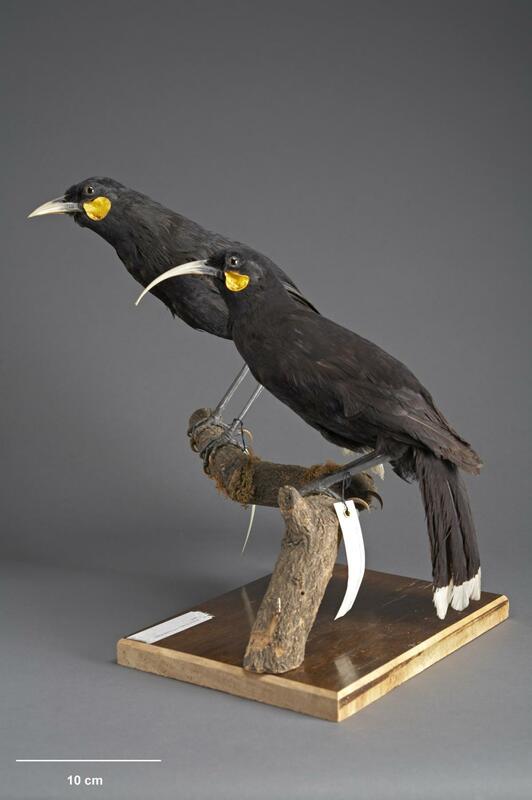 A captive pair kept by Buller hopped from branch to branch, fanning their tails, and caressing bills while making low twittering contact calls. This was thought to be a courtship display. 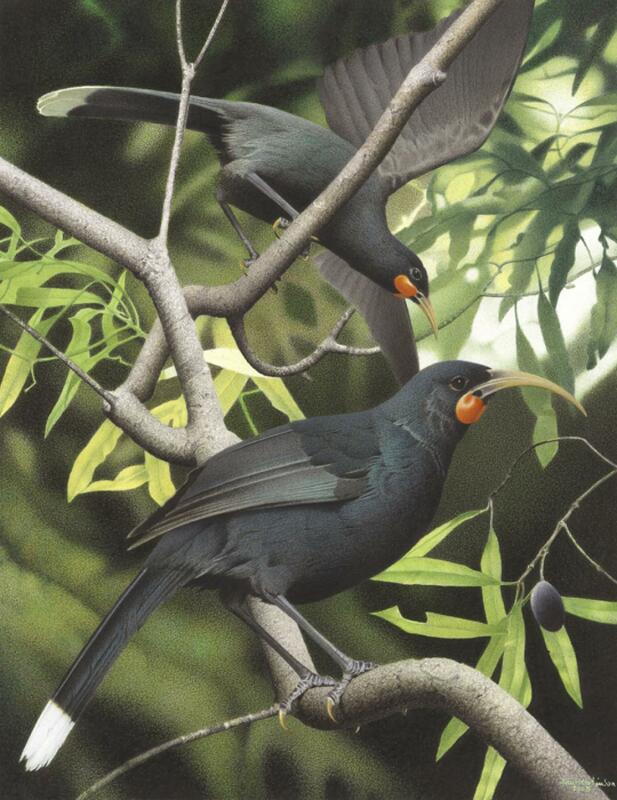 Male huia fed females during courtship, incubation and brooding, as do kokako and saddleback. Huia bred as monogamous pairs during September-February. The large saucer-like nest with cup-shaped centre had thick walls of woven grass, leaves and stems. The 2-4 stone-grey eggs with purplish-brown markings were laid in September-October. Incubation was mainly by the female. One brood of 2-3 nestlings was reared, mainly in November. Young remained in the family group, fed by both adults, for at least three months. There is also an unconfirmed record of a nest "in a rotten maitai tree, about fifteen feet from the ground" containing four eggs "laid in the rotten dust". Male huia used their bills as a "pick-axe" to dig into decaying wood, exposing and extracting huhu larvae and other insects. Females probed deeper using their longer, more decurved bill to extract larvae from more solid wood. Buller observed male-to-female transfer of food, but never in the other direction; he also described a pair apparently co-operating to hunt weta. Riley quoted Caldwell: "He hops along with a fine spider and very politely offers it to his better half, who seems to always appreciate his fine attention. And so they keep close together .... the female, with her slender bill, often getting a fine, fat insect, which, however, she does not give to her mate". Oliver quoted Wright: "I have watched them in pairs hunting for wetas. The male would tear away the outer part of a green sapling. The female then tried to retrieve the weta with her long slender bill. If not successful she would stand back while the male tried to enlarge the hole. Unless the tree was a maire the birds would generally succeed, and would then fly away with the weta". Different bills may have allowed pairs to exploit a wide range of food sources in different microhabitats, increasing the amount of food they extracted from a territory. Huia were "ecologically naive", with little fear of humans. 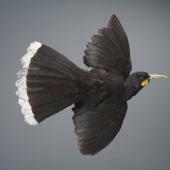 They seldom flew above tree-height, moving through the forest by hopping or bounding along branches and on the ground, similar to kokako, and were reputedly able to jump "twenty feet" at a time. Potts described huia, "bounding with a slight opening motion of the wings, flying only very short distances". They were reportedly the first bird to call in the "early dawn". The calls of the sexes differed. Duetting pairs repeatedly called alternately, answering one another; they called with their bill pointed 30-45 degrees from vertical. Huia mainly consumed wood-dwelling insects and their larvae, including huhu, weta, mantis, butterfly, also spiders, taken from decaying wood, bark, lichen, moss, ferns and the ground. They also ate native forest fruits, including hinau, pigeonwood, Coprosma, and kahikatea, and "vegetable matter". Buller, W.L. 1878. On the egg of the huia (Heteralocha acutirostris). Transactions and Proceedings of the New Zealand Institute 10: 212. Buller, W.L. 1888. 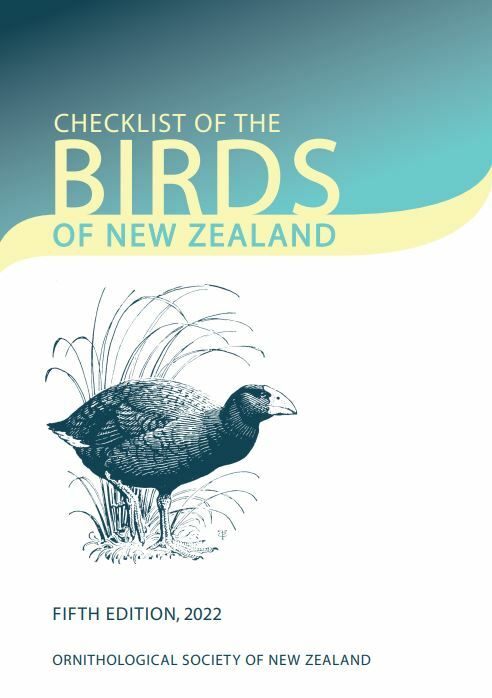 A history of the birds of New Zealand. Van Vorst: London. Buller, W.L. 1893. Further notes on the birds of New Zealand. Transactions and Proceedings of the New Zealand Institute 25: 63-68. Drummond, J. 1909. Notes on natural history in New Zealand. Evening Post, LXXVII, Issue 96, April 1909, page 13. Galbreath, R. 1989. Walter Buller: the reluctant conservationist. Government Print, Wellington. Lambert, .D.M. ; Shepherd, L.D. ; Huynen, L.; Beans-Picón, G.; Walter, G.H. ; et al. 2009. 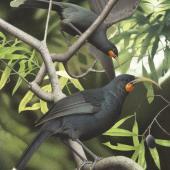 The molecular ecology of the extinct New Zealand huia. 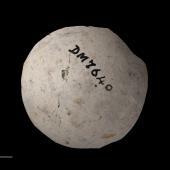 PLoS ONE 4(11): e8019. Park, G. 2006 Huia-eating in the Wairarapa. Forest & Bird, No. 321, August 2006. Phillips, W.J. 1963. The book of the huia. Whitcombe and Tombs, Christchurch. Potts, T. 1873. On the birds of New Zealand. Transactions and Proceedings of the New Zealand Institute 6: 139-153. Szabo, M. 1993. Huia: the sacred bird. New Zealand Geographic 20, October-December 1993. An extinct large black songbird with a glossy green-blue metallic sheen, long black tail feathers with white-tips, orange wattles that grew from the base of the bill, and long legs. Males had a robust pale ivory tapering bill grading to bluish-grey at the base and females had a longer, finer decurved bill; juveniles were brownish-black with white fleshy wattles.